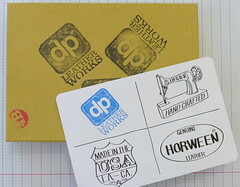 I am excited about the new Doane Paper Leather Works line, and when Chad Doane asked if I would like to give away the new 4 Barrel Holster to the readers of The Pen Addict I was all over it! The entire product line looks great, and holding this pen holster in my hands I can tell you that it feels great too. The Horween Leather is thick, but is soft, supple, and pliable to the touch. This is a product that is going to age well, and could become an heirloom item passed down from generation to generation. Along with the 4 Barrel Holster, the Leather Works line also has a Flap Jotter Cover and a Utility Notebook Cover. Be sure to take a look at the hi-res photo set for all of the leathery goodness. Please follow @jetpens on Twitter and "Like" JetPens on Facebook. This is not mandatory, but I sure would appreciate your support! Feel free to follow me @dowdyism and on Facebook as well. The contest winner will be posted on Thursday, September 1st. The winner will have one week to email me at the address posted in the right sidebar. This is a great product and I expect a lot of entries, so get cranking! Thanks to Chad Doane for providing this product, and be sure to follow him at DoanePaper.com and on Twitter @doanepaper. Posted on August 30, 2011 by Brad Dowdy and filed under Doane Paper, Giveaways.